N1‚000 per unit subject to a minimum Subscription of N5,000 and in multiples of N1,000 thereafter, subject to a maximum subscription of N50,000,000. INTERESTED INVESTORS SHOULD CONTACT THE STOCKBROKING FIRMS APPOINTED AS DISTRIBUTION AGENTS BY THE DEBT MANAGEMENT OFFICE. 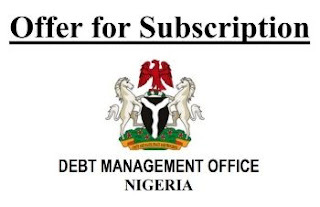 PLEASE VISIT www.dmo.gov.ng FOR THE LIST OF DISTRIBUTION AGENTS.